The measured quantity is the total area of the interface between the two phases of the sample (often air and sample) for 1 unit of weight or volume. Unit is m²/g or m²/cm3. Figure 1. The above example illustrates the estimation of the specific surface of silver nanoparticles in aqueous solution with the invariant method. 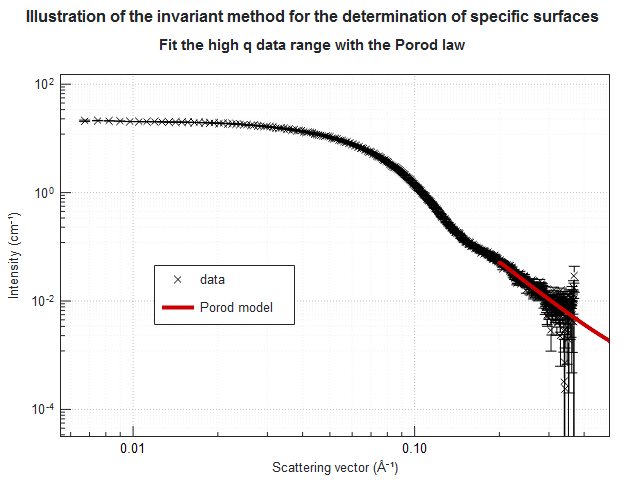 The high q data range is analyzed based on the Porod model law, whose slope in loglog scale is proportional to the surface to volume ratio of the particles. Furthermore, the Porod model is used to extrapolate the data to infinity in order to accurately calculate the total scattering power of the sample, a mandatory ingredient for estimating the specific surface of the silver nanoparticles (94.27 ± 5.23 m²/g in this example). – O.Spalla, S. Lyonnard and F. Testard in J. Appl. Cryst., 2003, 36, 338-347. 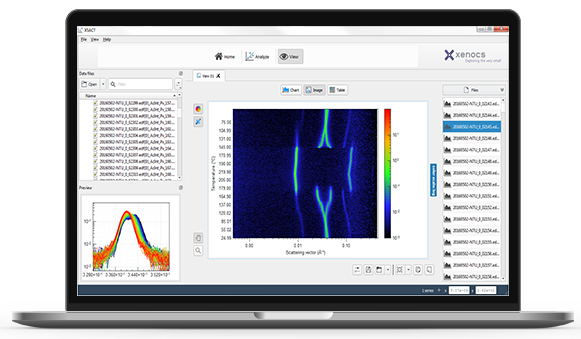 Why use SAXS for specific surface area determination? SAXS provides access to closed pores. Absolute intensity provides direct quantitative measurement. SAXS works at all temperatures. It is compatible with liquid suspensions. With SAXS, no sample preparation is required.